Gluten-free options have become popular in recent years because people can now enjoy their favorite food without putting their health at risk. If you love Italian food but have gluten intolerance, check out Benvenuto’s Italian Grill, a gluten-free restaurant in Beaver Dam. Our gluten-free restaurant in Beaver Dam offers pizzas, pastas, sandwiches, and more to people who avoid wheat products. If you experience bloating, abdominal pain, and irritable bowel syndrome every time you consume regular bread and pasta, then you could have gluten intolerance. This means that your body does not produce enough enzymes to digest gluten, a protein found in wheat products. The symptoms are not just related to digestive issues. Even fatigue, acne, and headaches can be signs that your body does not react well to gluten. Who doesn’t love pizza? With your choice of toppings and savory sauces, you can order the perfect pizza at our gluten-free restaurant in Beaver Dam. You can choose among our Benvenuto, Margherita, Veggie, Three Meat Combo, BBQ Chicken, and Formaggio pizzas when you visit our gluten-free restaurant in Beaver Dam. We even have a five-cheese blend at our gluten-free restaurant in Beaver Dam guaranteed to delight cheese lovers. Pair your pizza with a hot plate of perfectly cooked pasta from our gluten-free restaurant in Beaver Dam. We pair our signature sauces with gluten-free penne that will make you forget about all the other pasta dishes you’ve tasted. Whether you prefer shrimp, chicken, or sausage, you can find the pasta dish to satisfy your taste buds at our gluten-free restaurant in Beaver Dam. Instead of your usual fast-food lunch, why not opt for a specially prepared sandwich from our gluten-free restaurant in Beaver Dam? We use only the freshest ingredients at our gluten-free restaurant in Beaver Dam. From our burgers to grilled chicken sandwiches, we serve up creations that taste as good as they look. All of the sandwiches at our gluten-free restaurant in Beaver Dam are served with your choice of side dish. If you are looking for a hearty meal to satisfy your appetite, we recommend the main courses at our gluten-free restaurant in Beaver Dam. We offer baked cod, grilled shrimp skewers, and smothered chicken, which all include one side dish and your choice of soup or salad. These complete meals at our gluten-free restaurant in Beaver Dam will keep you coming back for more. Treat yourself to a generous serving of mouthwatering steak at our gluten-free restaurant in Beaver Dam. We choose premium cuts of meat, which are grilled to perfection and paired with side dishes to complement the strong flavors. Some of the side dishes we serve at our gluten-free restaurant in Beaver Dam include seasoned broccoli, roasted asparagus, and garlic mashed potatoes. Aside from the quality of our food, another reason to visit our gluten-free restaurant in Beaver Dam is our range of dining options for patrons. 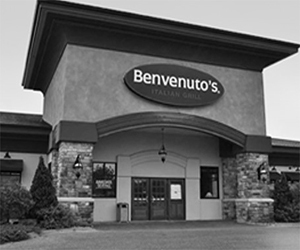 Whether you need a gluten-free restaurant in Beaver Dam for a business lunch, romantic dinner, or family gathering, Benvenuto’s Italian Grill can provide you with exactly the meals and ambiance you are looking for. If you are on the go, you can simply order takeout at our gluten-free restaurant in Beaver Dam. For even more convenience, our gluten-free restaurant in Beaver Dam offers delivery services seven days a week. Contact our gluten-free restaurant in Beaver Dam today for more details! Have an unforgettable dining experience at Benvenuto’s Italian Grill. One taste of our delightful Italian dishes will surely leave you wanting more. Click here to sign up for our rewards program. Bring your friends and family over to one of our locations today!